Toilet Bowls and Double Rainbows, This is My Life. Have you ever had a day that seemed to sum up your entire life? I was at work, and I volunteered myself for the “fun” task of pulling a cell phone out of the toilet in the ladies restroom. Now before you start thinking, “EEEWWWWW!!! !” It gets better. It was covered in human excrement. Yup! Someone had dropped their little red phone in the toilet, flushed it, and at least one other “someone” had done their business, clogging the toilet. Now you can insert your, “EEEEEEEWWWWWWWWW!!!! !” here. One of my coworkers had bravely plunged the toilet until the cell phone dislodged itself, but she couldn’t bring herself to go fishing for it. Can you blame her? Apparently, I’m the person you call when these things happen. “Juli will know what to do.” I put rubber gloves on my hands and one more glove on a pair of pliers, sticking the pincher part into the finger holes, covering the handles with the palm portion. I tried not to think about what I was doing, and out came the phone. I dropped it straight into the trash. Would you want a phone that had sat overnight in a toilet full of human feces? There aren’t any words to describe how disgusting that phone was. I pulled off my gloves, pulled the glove off my pliers, and washed my hands and pliers over and over. The gloves did their job, but still, you can’t wash them too much after something like this. Afterwards, I was told to come outside quick, and bring my camera. 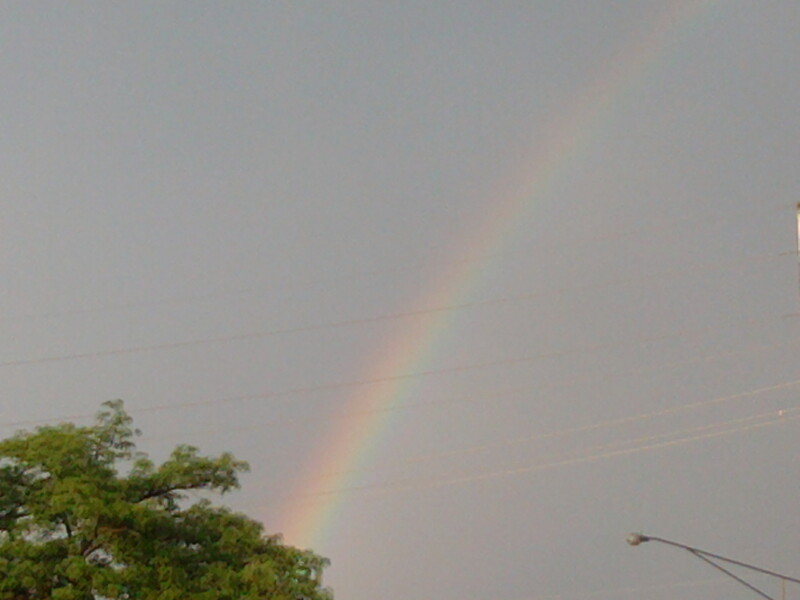 There, in the parking lot, was the biggest rainbow I’d ever seen. It started out as a double rainbow, but I couldn’t take the pictures fast enough to capture it. I didn’t cry or scream like the dude in the video that was circulating around the Internet. I did think the rainbow was one of the coolest things I’d seen in a while. 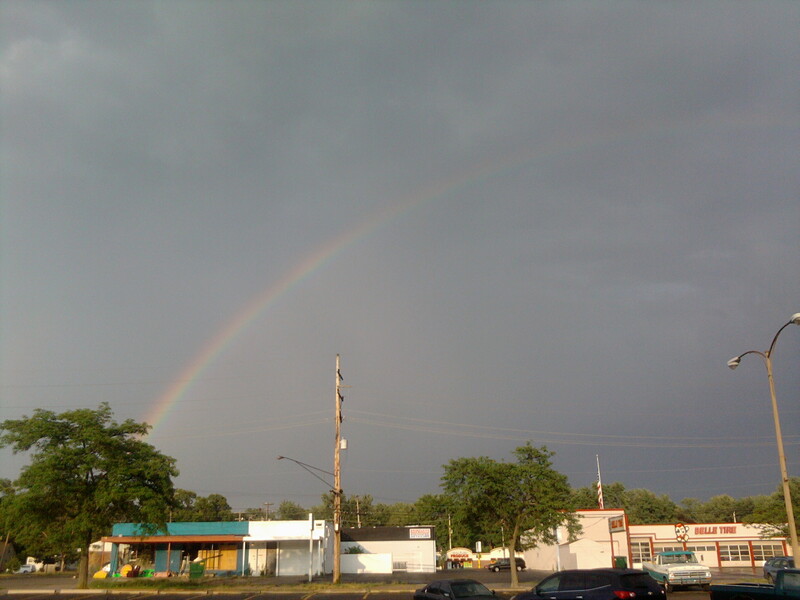 Left hand side of rainbow, as seen from the parking lot at work. 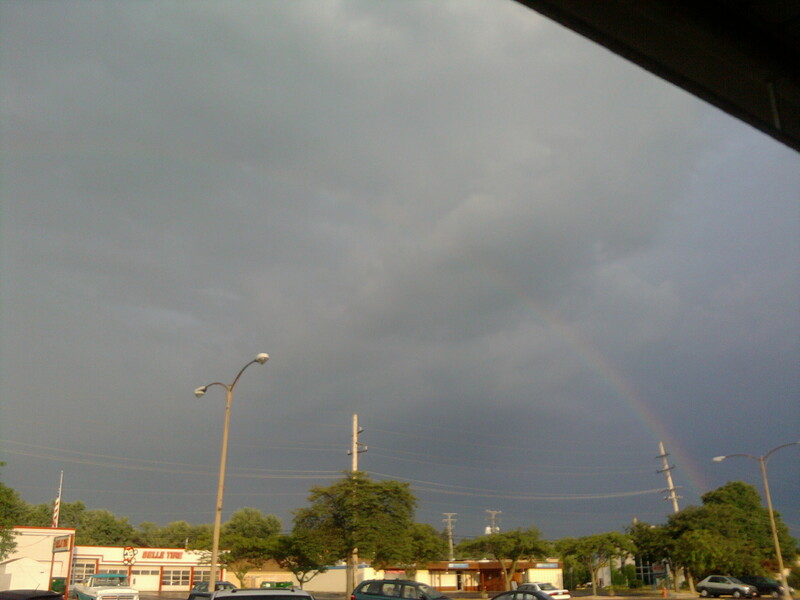 Right hand side of rainbow, as seen from my parking lot at work. I think that day at work summed up my whole life in a nutshell. I’ve experienced some pretty crappy stuff. I’ve also had some awesome things happen to me. It always balances itself out, the good with the bad, the gross with the beautiful. I can never get too far ahead or behind in life. If I get a bonus at work, something falls off my car. If I break a window, I have to trust that I’ll get a little overtime pay, etc. to cover it. That’s just the way my life is. You can blame it on whomever or whatever you want, but I’ve gotten pretty used to it. If things are going terribly bad, I’m curious as to what will happen next. If too many positive things start to happen, I better brace myself, the universe will balance itself out eventually. Next postRandom dragonfly photos from the front yard. I always have that sensation of waiting for something bad to happen when things have been going too well. ‘Tis the way, all right. I’ve been told that “waiting for something bad to happen” is a terrible way to live, and yet I’m generally a happy person, happier than most people I know. I think it’s because I expect bad things to happen. If I’m wrong, then that’s a good thing. If even the tiniest thing goes right, I’m shocked, but in a good way. My glass is not only half empty, but I think someone else already drank out of it and now there’s something floating in it. LOL I wasn’t always this way, but now that I am, I find happiness in the mudane. Woodchucks ate ALL my flowers, I expect this. Finding out they DON’T like my strawberry plants, my raspberries, or the neighbor’s tomato plants, YAY!!!!!! So there’s a video of a guy crying and screaming over a rainbow? That’s creepy that he was that excited. LOL I’m guessing he was drunk at the time. I have no words to describe the grossness… I;d have thrown up just looking at it. Ha ha! I thought of that video when I saw the title of this – I was gonna leave a link in the comments, LMAO! !